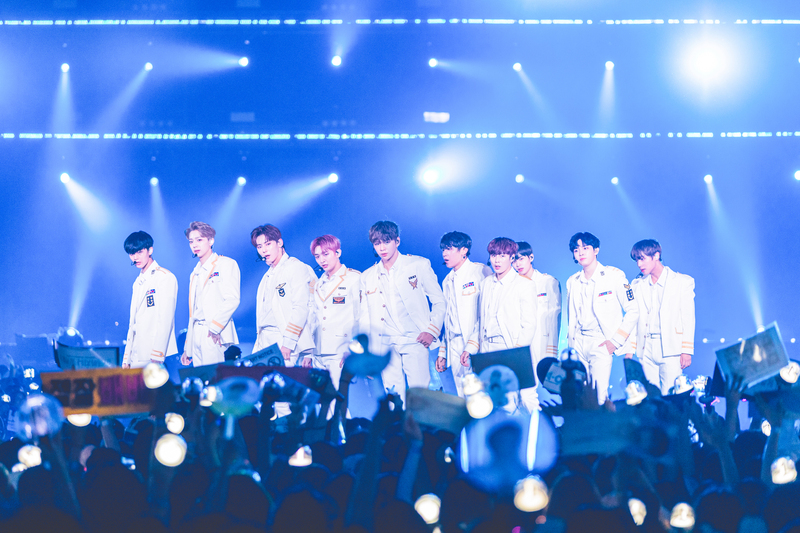 Formed through the second season of Mnet's popular survival show Produce 101, Wanna One has gained a lot of recognition since their debut in 2017. The show basically sees trainees from different entertainment agencies (and even some individual trainees who aren't part of any agency) battling out in a series of challenges for the chance to debut as an idol in a project group. With a whopping line-up of 11 members, Wanna One consists of Yoon Jisung, Ha Sungwoon, Hwang Minhyun, Ong Seongwu, Kim Jaehwan, Kang Daniel, Park Jihoon, Park Woojin, Bae Jinyoung, Lee Daehwi and Lai Kuanlin. The gap between the oldest and the youngest member is 10 years! This is the group's second time in Singapore, having previously held a fan-meeting at Zepp@BIGBOX. 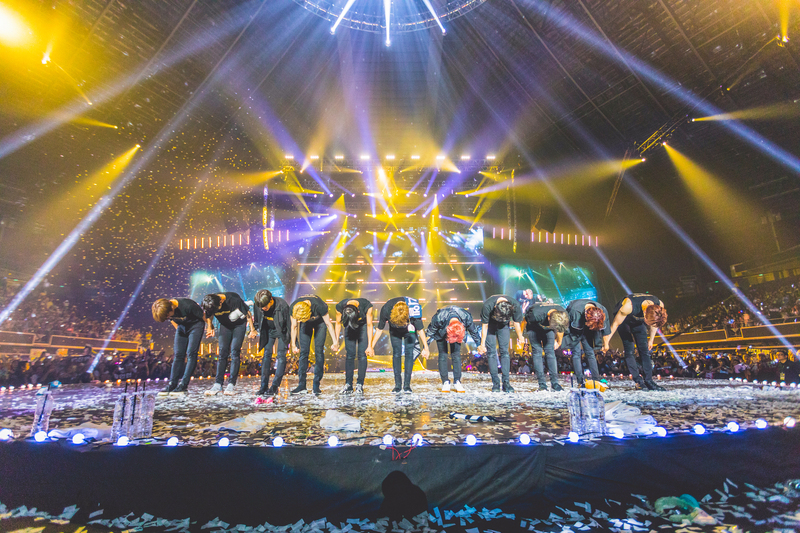 This time, they were in Singapore for their ONE: The World tour. 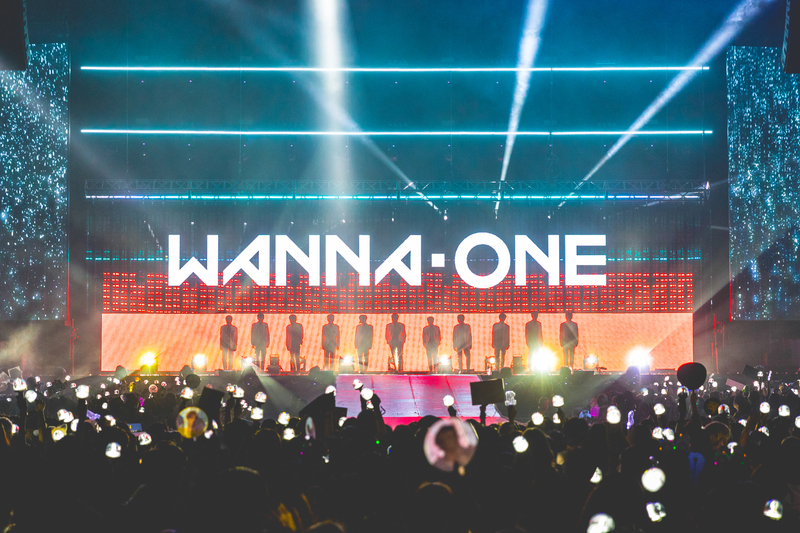 The concert was held at the Singapore Indoor Stadium, which was filled with throngs of young teenagers, decked in their headbands, holding Wanna One's light stick or merchandise and their customized fan-made boards. Security checks, however, were rigid and they were especially strict about photography and videography this time around. Fans who took photos/videos will be asked to delete them immediately and if they were caught for the second time they had to be thrown out of the venue. As you probably heard by now, some fans were unfortunately thrown out and even got their tickets torn up – all because of this strict rule. A little harsh, don't you think? After a long wait, Wanna One finally appeared on stage. The boys kicked it off with their older songs – 'Burn It Up', 'Never' and 'Energetic'. The fans were screaming, waving their light sticks enthusiastically, singing along and yelling the fan chants with all their hearts. The lights were crazy (though an photosensitive epilepsy trigger warning would be appreciated next time round) and the pyrotechnics were off the charts, the stage set-up was impressive and fit for the gods. I couldn't stop gawking in awe. Despite their rookie status, Wanna One know their fanservice inside out. 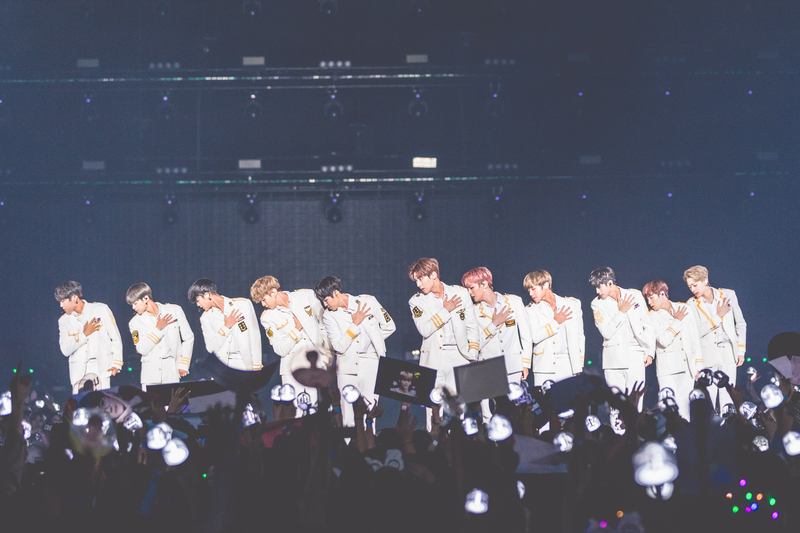 They cheekily winked at the (official) cameras, threw finger hearts to their fans (whom they lovingly refer to as 'Wannables') and exuded their powerful stage presence. Their latest album saw the 11 member group dividing themselves into sub-units: Triple Position (Kang Daniel, Kim Jaehwan, Park Woojin), Lean On Me (Hwang Minhyun, Ha Sungwoon, Yoon Jisung), The Heal (Lee Daehwi and Ong Seongwu) and No.1 (Bae Jinyoung, Lai Kuanlin, Park Jihoon). The night's line-up was diverse with a good variety of solo stages and group performances. It was also an emotional rollercoaster! From cheerful and lively, sensual and moody to soft and sweet, the boys really got us feeling all sorts of things. I was personally brought to tears during Lee Daehwi and Ong Seongwu's stage for the song 'Sandglass' which was accompanied by a short montage of their journey from trainees on Produce 101 to the super rookies they are today. 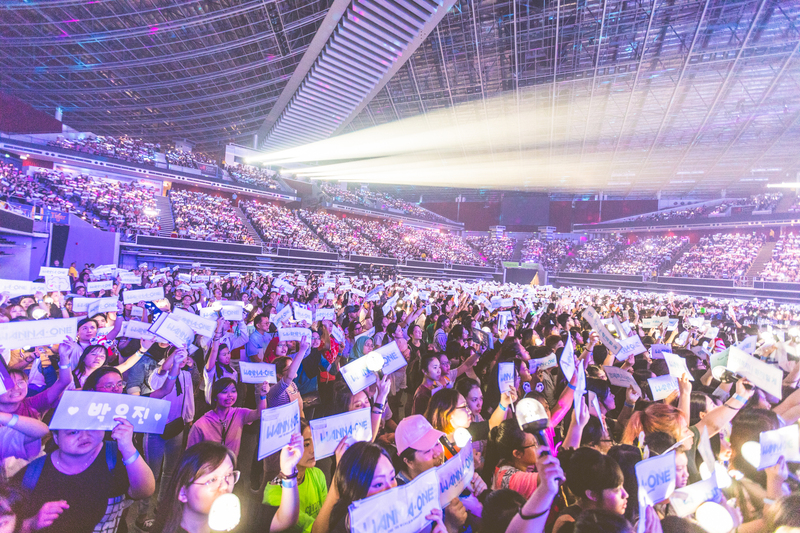 A K-pop concert wouldn't be complete without a fan project. Wanna One's Singaporean fan base distributed banners earlier on outside the venue before doors opened. The fans lifted up the banners during 'I'll Remember' and sang along to the lovely song. Jaehwan's solo intro for 'I'll Remember' sent shivers down my spine – his live vocals are really no joke. Daehwi praised the Singaporean Wannables saying that they could sing better than all of them combined! The boys also had their go at Singlish with the 'Selca Time' segment, where they had to re-enact their reaction to a certain scenario to the best of their ability. The scenarios included consoling a sulking girlfriend, drinking something refreshing and eating Singapore's famous chilli crab. They surprised us all by quipping in Singlish ('Damn nice!' and 'So shiok!') in their reactions, especially when the youngest member Kuanlin, said 'Damn Nice!' while showing off the highlight dance move for their song 'Boomerang'. Another interesting stage to me was when the leader and oldest member Yoon Jisung, transformed into a certain DJ Hankki and turned the stadium into a club! While he was spinning, a few of the other members slowly came on stage to dance along. The addition of EDM was a refreshing twist to the night. Before we knew it, though, the boys were down to their last song and the fans were distraught. The members expressed their love to their beloved Wannables and told them that they will see them again very soon. It was a night filled with laughter, passion and appreciation. The boys were giving back the love the fans have showered them with since day one. Wanna One has reached great heights in a short amount of time. You can tell that these boys are savouring their moments as a group while they still can before they are set to disband in December this year. Until then, let's continue to support Wanna One and their future endeavours! I'm ready? Okay, I'm ready!" — Kim Jaehwan preparing for his selca time scenario. It's getting crowded at the front, can we all take one step back... Please?" — Responsible and caring leader, Yoon Jisung. Are you ready to get turnt up?!" — In the softest voice ever, Lee Daehwi. — Ong Seongwu, in every situation possible.